The Firebug team released Firebug 2.0.7. This is a maintenance release ensuring compatibility with latest Firefox release. Firebug 2.0.7b1 has also been released to update users on AMO beta channel. This version is exactly the same as 2.0.7. Firebug 2.0.7 fixes 1 issue. Firebug 2.0.7 is not compatible with upcoming Multiprocess Firefox (read more about e10s), but we are already working on Firebug 3 (alpha available for testing) that is fully compatible. 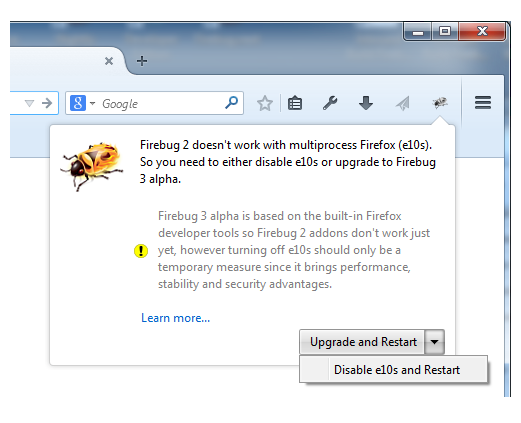 Note that Firebug 2 users will be automatically prompted for update when running in e10s enabled browser. The following panel will be displayed when clicked on Firebug start button. Read more about Firebug & e10s. This entry was posted on Tuesday, December 9th, 2014 at 7:30 am	and is filed under Firebug Releases, Firefox. You can follow any responses to this entry through the RSS 2.0 feed. Both comments and pings are currently closed.